I’m talking legit, diner-style breakfast with pancakes the size of your head, 3-egg omelettes, which seem more like 8-egg omelettes (I’m not complaining), Benedict everything, and plenty of toast and home fries. And how could I forget the bacon and sausage? Duh. I wish my schedule allowed me to have a diner breakfast everyday. But maybe it’s a good thing it doesn’t since I’d have to go back to wearing maternity clothes to make room for my breakfast food baby. Not to mention the perpetual food coma I’d be in. It is a nice treat to go out for breakfast every once in awhile on the weekends though. It’s great to be able to take your time, enjoy your breakfast and the company you’re with, all while having gallons of coffee. But why should we be deprived on the weekdays? Can’t we have just a little bit of that weekend indulgence during the week? I was thinking, which component of a big, diner breakfast could I have that could carry me through the week and still be healthy? I wanted it to be something I can make a batch of during my meal prep on Sundays. It was hard to choose because I love everything, but I finally narrowed it down to home fries. 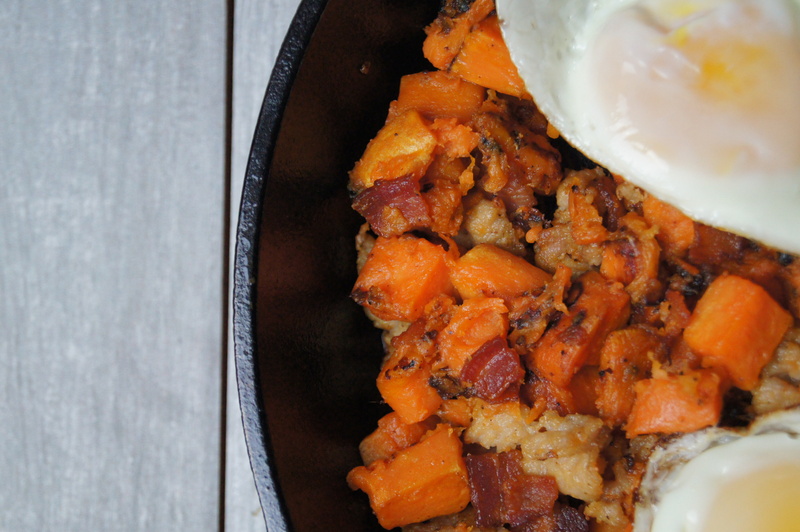 I love sweet potatoes and I wish more restaurants would offer sweet potato home fries. So I decided to use them here. I also love bacon and sausage and always have a hard time choosing between the two so I decided for this recipe I was going to use both. Why not, right? To make it healthy I used Trader Joe’s chicken breakfast sausage, which is really flavorful, and their nitrate-free bacon. You could even use chorizo instead of the chicken sausage. I’m drooling just thinking about that option. 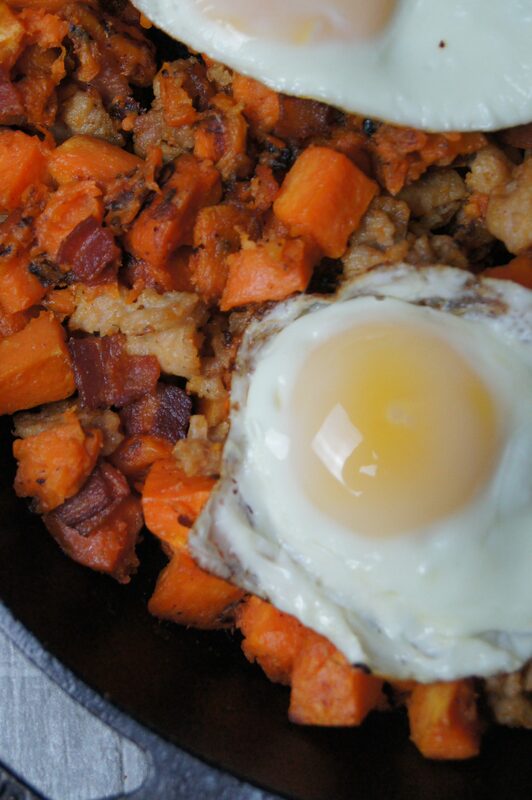 I love this recipe not only because it tastes good, but also because it’s easy to make. And it doesn’t have to be just for breakfast. It makes a great lunch or dinner too. 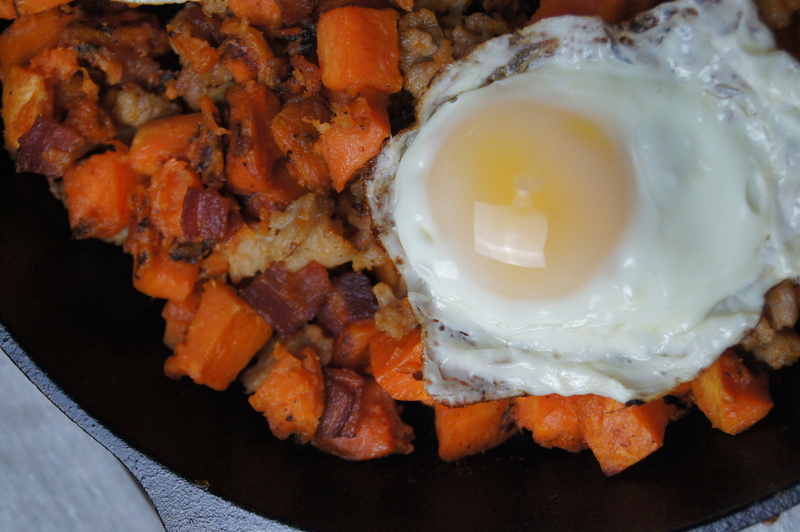 A good, runny egg completes these home fries. And to go to 11, you could top it off with Hollandaise sauce. Wow. How amazing does that sound? 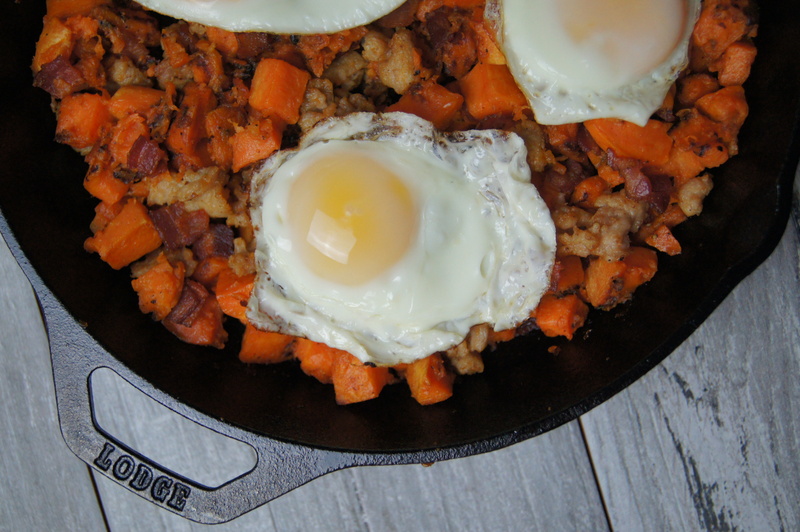 My recipe for fully-loaded sweet potato home fries will make you miss a good diner breakfast a little less during the weekday. It might even make you wish this was on the menu the next time you’re at the diner, sipping on your third cup of coffee. 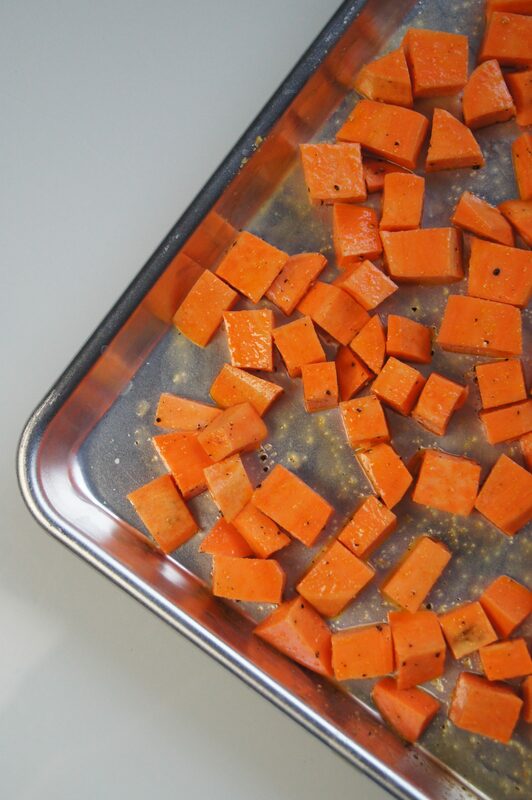 Place diced sweet potatoes on a baking sheet. Sprinkle salt, pepper, and garlic powder on sweet potatoes. Drizzle olive oil on potatoes and toss well until sweet potatoes are evenly coated. Roast sweet potatoes in a single layer for 20-25 minutes, tossing occasionally, until sweet potatoes are tender and golden. 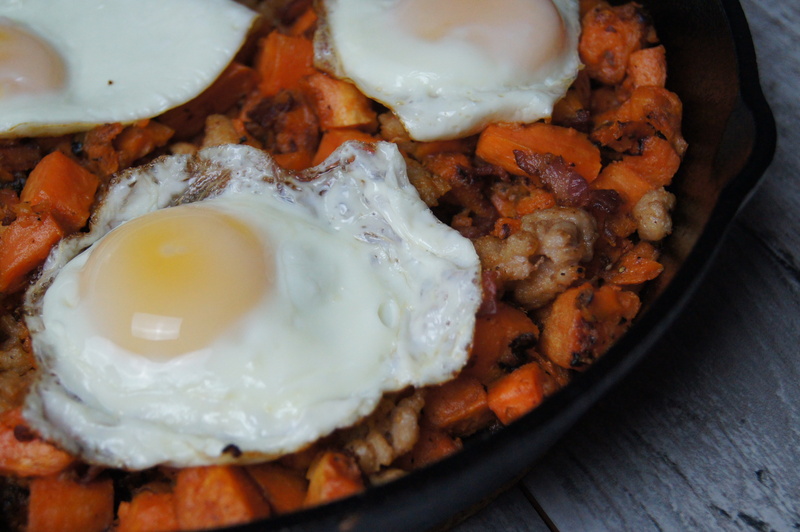 Heat a 10-inch pan, preferably a cast iron pan, to medium high heat. Add bacon and saute until crisp. Remove bacon and place on a plate lined with paper towel. Remove all but about 1 Tablespoon of bacon grease in pan. Sauté chicken sausage, breaking up into pieces, until cooked. Remove from pan and set aside. 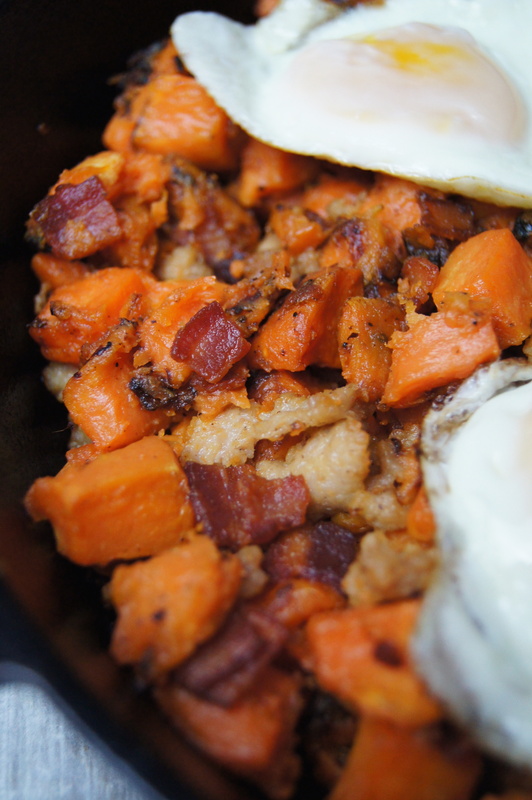 Add roasted sweet potatoes to pan and let sweet potatoes crisp up, about 3-5 minutes. 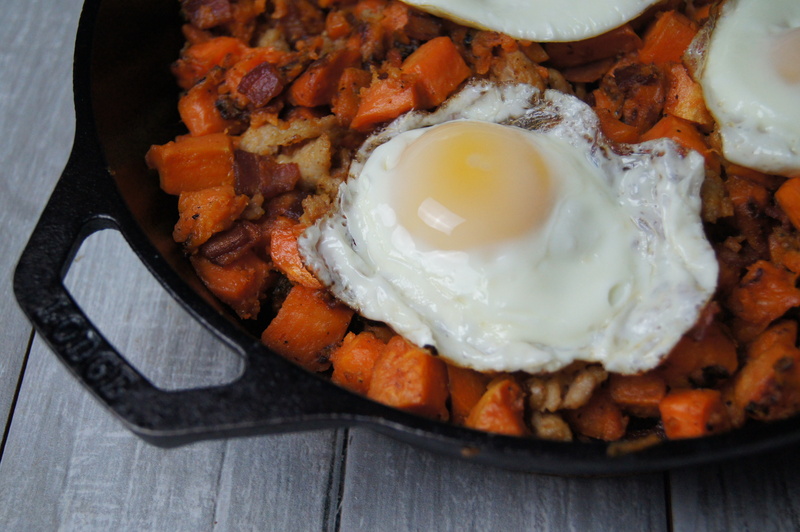 Add bacon and chicken sausage back to pan and toss together with sweet potatoes. Serve with fried eggs and top with Hollandaise sauce, if using.